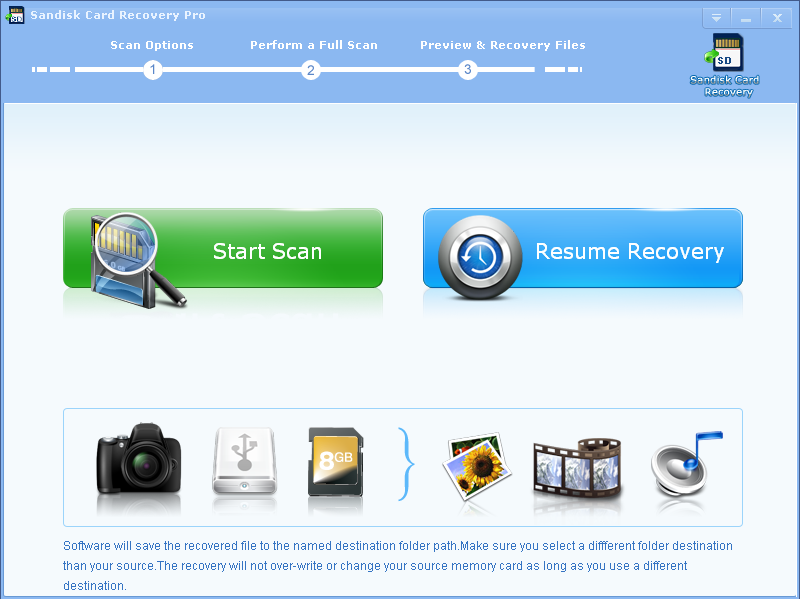 Best Sandisk Card Recovery Software, recovering files in 3 Steps! 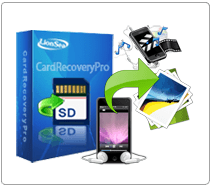 Sandisk Card Recovery Pro is outstanding card recovery software which is specialized in recovering lost photos, undeleting missing pictures, retrieving formatted SD card and recurring deleted files. Using Sandisk Card Recovery Pro is safe and risk-free. The software performs read- only operations on your memory card. It doesn't move, delete, or modify the data on the card to avoid causing further damage or overwriting the source. Sandisk Card Recovery Pro is easy-to-use memory card recovery software. The software can effectively recover deleted or lost photos, music, video, and multimedia files from almost all digital cards after disasters like erroneous deletion, corruption or formatting errors, etc. Using Sandisk Card Recovery Pro is safe and risk-free. How to recover photo from sandisk card? The software performs read- only operations on your memory card. It doesn't move, delete, or modify the data on the card to avoid causing further damage or overwriting the source. It recovers photos, music, video, and multimedia files from the source memory card and saves them to the destination location you specify in just a few steps. No matter you are a computer novice or an advanced computer user, you can undelete your lost files from Sandisk SD Card Recovery Pro easily. Besides, Sandisk Card Recovery Pro is distinguished from the other recovery software because it has preview function which is designed for people to see thumbnail display of recoverable photos or files. 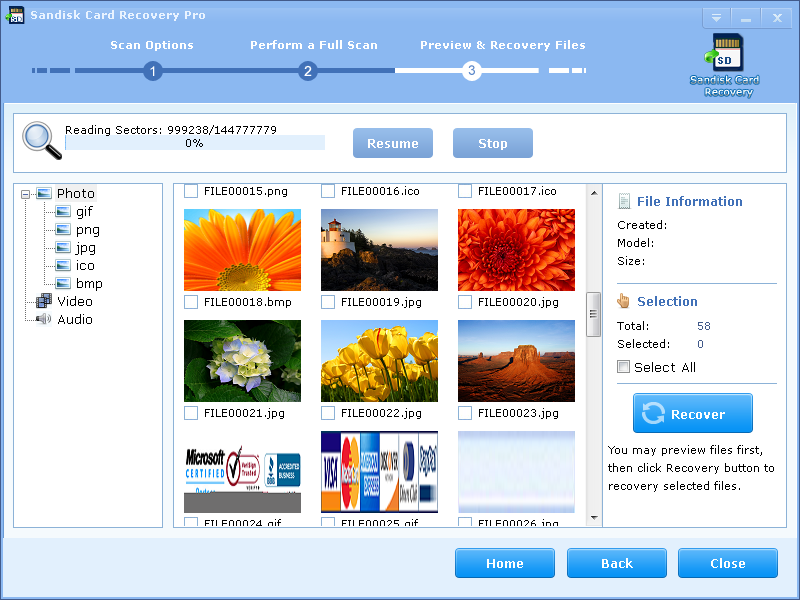 Safe Recovery is created to recover CF card safe and sound. It has been strongly proved that the software supports more than 100 different file types. It is observed that Sandisk Card Recovery Pro supports almost all famous digital camera brands in the market, such as Nikon, Canon, Kodak, FujiFilm, Casio, Olympus, Sony, SamSung, Panasonic, Fuji, Konica-Minolta, HP, Agfa, NEC, Imation, Sanyo, Epson, IBM, Goldstar, LG, SHARP, Lexar, Mitsubishi, Kyocera, JVC, Leica, Phillips, Toshiba, SanDisk, Chinon, Ricoh, Hitachi, Pentax, Kinon, Verbatim, Vivitar, Yashica, Argus, Lumix, Polaroid and Sigma. Download Sandisk Card Recovery Pro and get your lost data back! * Sandisk Card Recovery Pro will undelete all types of files from your Sandisk card or disk.